Sonic Port VX is the only mobile recording interface that puts the power of a studio into the hands of songwriters on the go. 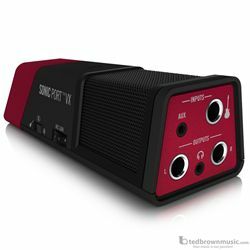 With Sonic Port VX, you can finally develop ideas and record complete multi-track songs however, whenever, and wherever you want. BUILT-IN STEREO AND MONO: Sonic Port VX features professional preamps and built-in stereo and mono condenser mics that help you create tracks with stunning quality and dynamics. Record live performances with remarkable clarity. Capture the raw energy of your songwriting sessions. Make every demo worthy of being the final take. Track guitars in the basement, drums in your living room and vocals in the closet. Inspiration can strike anytime, so capture it wherever you are. SEAMLESS PERFORMANCE WITH iOS, MAC AND PC: With seamless compatibility on iOS, Mac and PC, Sonic Port VX gives you the power to create on any device, at any location. Sneak into a cathedral and record soaring vocals on your iPad®. Track thundering drums in a stairwell using your MacBook®. Then add additional tracks and fine-tune the mix on your home studio PC. Sonic Port VX includes a Lightning™ cable connection so you can use your iOS device along with Mobile POD, GarageBand®, and other Core Audio music apps to easily record complete songs, without restrictions. LEGENDARY LINE 6 GUITAR TONE: Jam with the sounds of your favorite artists. What do you get when you combine an unrivaled audio interface with legendary Line 6 tones? The best way to track guitar or bass, wherever you are. The included Mobile POD app gives you over 10,000 presets designed by artists, Line 6 and other players- plus the ability to mix and match 32 amps, 16 effects and 16 speaker cabs to define your own sound. Mobile POD also lets you use your custom tones when playing along with your iTunes® library.